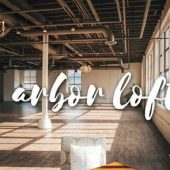 This new, industrial chic event venue, located atop Hart’s Local Grocers, is in the heart of the East End and conveniently located to the Little Theatre. Resplendent with historical detail, The Century Club of Rochester was built as a private residence in 1896. 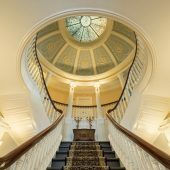 The home was designed with weddings in mind- Albrecht Vogt, the original owner and builder of the house, created a grand staircase and Tiffany-style Occulus to provide a dramatic backdrop for his daughters to use on their wedding days. Today, The Century Club is open for private events. The Sony Festival Lounge is located to the right of the lobby of Little Theatre #1, and is accessible directly from East Avenue. In 1929, The Little Theatre opened its doors with a mission of providing moviegoers with an intimate alternative to the Hollywood-dominated programming that was standard fare at the large downtown movie houses. Over the years, The Little has stayed true to its mission by providing Rochester with an independent spirit. They have expanded from the historical landmark Art Deco theater on East Avenue to include four more screens, a café, art exhibits, live music, film festivals, talkbacks, and educational programs. Theater 1, the largest screening venue and the original theater, is housed in the signature building on East Avenue. The official partner hotel of the 2018 High Falls Women’s Film Festival, downtown Rochester’s premier boutique hotel is perfectly placed at the crossroads of Rochester, NY’s cultural and business districts. The Strathallan combines unique access to local highlights with an exceptional level of personal service—all in a setting that brings a history of luxury into vibrant, contemporary focus. Fine dining also awaits with the on-site restaurant Char Restaurant and Lounge, offering a menu featuring the finest cuts of steak, prime seafood choices and other chef-inspired culinary creations. Rooftop lounge Hattie’s offers creative cocktails, sushi and Asian fusion cuisine and unparalleled views of the Rochester city skyline. Surround yourself with style…at the Strathallan. The hotel offers a special rate for Festival guests of $159 for a one room suite and $169 for a 2 room suite per night plus taxes, subject to availability. 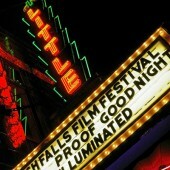 Book by phone by calling 585-461-5010 and asking for the High Falls Women’s Film Festival rate, or book online here. 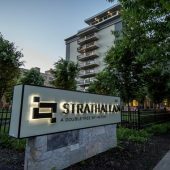 Learn more about the Strathallan at http://www.strathallan.com/.